In the battle of bed bugs there is a new tool in the arsenal - the Packsafe thermal luggage treatment. Instead of waiting to react to the sighting of a bed bug, Proactively preventing bed bugs and other pests from being introduced into a facility is now easy and affordable. The Packsafe works by simply heating luggage, backpacks, purses, clothes, shoes and other possessions to a bed bug killing temperature. Because the heating process is slow and controlled, personal belongings are not harmed! Available in multiple sizes, the Packsafe thermal luggage treatment device is the most effective method of preventing bed bugs from being unknowingly introduced into your facility. Bed bug prevention offers peace of mind to staff and clients and is a perfect tool for both those who have dealt with bed bugs as well as those who have never seen a bed bug and want to keep it that way! PackSafe is a SAFE, NON-CHEMICAL way to treat personal items for bedbugs. 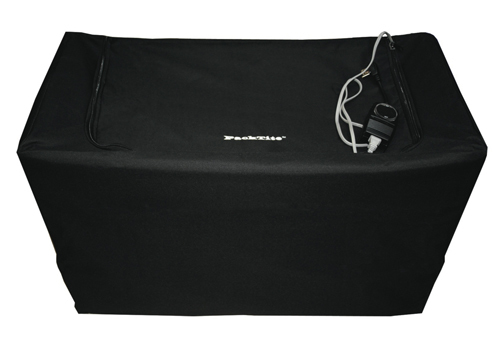 Using a patent pending technology, PackSafe gently and thoroughly heats luggage and its contents to a temperature that is proven to kill all stages of bedbugs.